Bill.com is today recognized as the nation’s fastest-growing business when it comes to payments network. Since its founding in 2005, they have reached nearly 200.000 users and today has over 600 employees. Our first time working with Bill.com was back in September of 2014 when we helped them complete a formal branding of their reception area. Being satisfied with the results, they called on us to help continue the branding of their Palo Alto headquarters. To accommodate their vision for the branded environment, we chose these super-sized graphics for their empty walls. 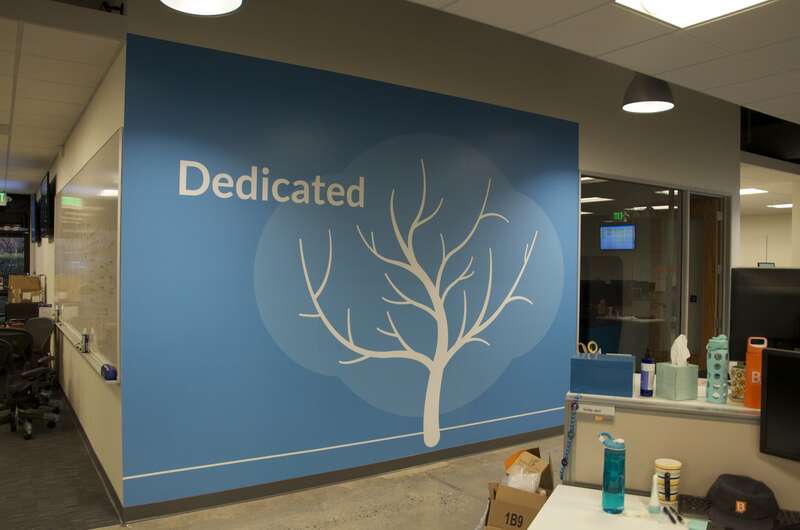 During the first round of exploring the possibilities the team at Bill.com made it clear that they wanted to display their company values throughout the office. They also wanted to make it possible for the employees to interact with the graphics and think about what the values mean to them. The final results consisted of two separate acrylic signs and 6 wall graphics, one for each of their values, throughout the office.